“Oh lord, stuck in Lodi again” Yes!!! | What Goes with What? “Oh lord, stuck in Lodi again” Yes!!! The plaintive lament from Credence’s “Lodi” song of 1969 dealt with the failure of traveling musicians having to stay in what was and still is a flat and dusty town that was primarily irrigated dirt farming back nearly 50 years ago. Of course the band went on to great success and the farmers and vintners of Lodi have followed along. The Lodi appellation is directly East of San Francisco at the edge of the Sacramento River Delta. A Mediterranean type climate produces fruit forward wines with big dark fruit flavors and lower tannins. Mondavi – Woodbridge and E & J Gallo Wineries built their brands on bulk wine from Lodi. Oh, did I mention that the late Robert Mondavi grew up in Lodi, yes that Robert Mondavi. Vegetable farmers became grape growers then wine makers when at some point a younger generation person suggested that they could sell wine for $12 a bottle instead of the grapes for $1,200 a ton. I got smiles and nods from everyone I suggested that story to as they confirmed the history. 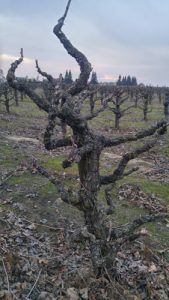 You should know that 20% of California’s premium wine and 40% of its premium Zinfandel comes from Lodi and here’s the capper – the dairy industry is a close second to wine production in Lodi, MOOOOV over Zin. We were warmly welcomed by the owners, winemakers and staff during our brief visit. I was taken by the friendliness and true caring that everyone expressed about their products and their proud heritage. I made certain brands from the wineries we visited are available in the Chicago area and specifically at Famous Liquors in Forest Park and Lombard, some Whole Foods as well as Binny’s. It’s always good to check before you go. Funny thing, we’ve been drinking Scotto Cellars Howling Moon Zinfandel’s for over ten years and didn’t know it was only a portion of the 40 brands in the Scotto line. In fact you’re probably more familiar today with their fighting varietal series of Rare Red, Rare White, Rare Black, etc. The Scotto family has been making wine since 1903 in Brooklyn NY, eventually the family moved to California for the harvest in 1963. Three Sons and a daughter are now the principles of Scotto Cellars. Paul 38 is the hands on director of wine and cider making for all 40 brands and total production of nearly 400,000 cases that are available in most states. “We always do research, as we don’t like to tell people no unless we have searched all aspects of a concept or request” Paul stated in response to my question regards how you grow without making mistakes. He commented further, “”Not everything works, but if you don’t try you’ll never know, we think the sky’s the limit”. He impressed me with his business savvy telling me they didn’t add business without adding someone responsible for that business. “Were always looking to see how we can fit into a customer’s (wholesale/retail) needs by offering something from one of our existing lines or by developing a new product specifically to fill their desires”. The Michael David winery is actually in the original family fruit stand built in 1972. Quite uniquely, the wine tasting bar, Café and bakery, (great pies) and farm produce still exist side-by-side in the same building. It’s different. The Phillips family has been farming since the 1850’s and cultivating wine grapes since the early 20th century. Brothers Michael and David Phillips are 5th generation grape growers and now big-time winemakers. David, the president and co-owner of the winery, shares lunch in the coffee shop. He has recently returned from a marketing trip to Southeast Asia and specifically Vietnam. 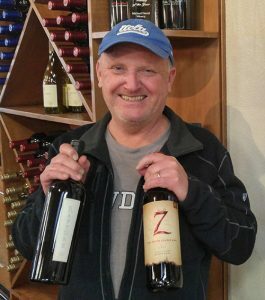 He proudly reminds me that the 7 Deadly Zins brand ($14) is the largest selling Zinfandel in the world and is a major contributor to the wineries just under 1 million cases a year volume. He leads us next door to reveal a gorgeous new tasting and event facility that’s quite different – almost theme park like – than the truck stop environment of the current tasting room, coffee shop and vegetable stand, it’s Lodi. 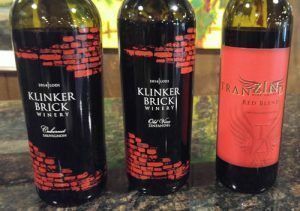 Klinker Brick winery was opened in 2000 by fifth-generation grape growers whose family farms date back to the 1900s. We sampled with the laid-back owner Steve Felten and his charming and informative daughter Farrah Felten-Jolly, V.P. of sales and marketing at their small but comfortable tasting room. You’ll find the zins most everywhere but the cab may take some looking for. 2014 Old Ghost Old Vine Zinfandel, huge lovely rich fruit a lot of bramble Berry fruit and exotic spices – 92 points – $30. 2014 Cabernet Sauvignon, it’s quite nice, dry and complex with aromas of blackberries, cassis and cloves and flavor of cherries – $20. Oak Farms Vineyards was created in 2010, again the Lodi story. 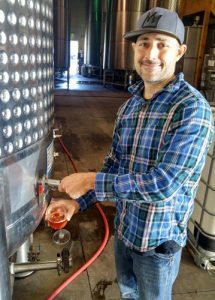 Dan Panella is co-owner and winemaker. The winery is a lovely low-key space. Dan tells me they produce 20,000 cases from sandy loam soil and that the wines are available at Whole Foods and at Mariano’s. The Mettler family has been farming wine grapes in Lodi since the late 1800s and is one of Lodi’s oldest farming families. The family is involved from the vineyard to the bottle, growing, harvesting, trucking, winemaking and sales. While we had an appointment, the tasting room was actually closed on the day that we were there and Madison, the Wine Club Director took us through a quick tasting. The quality of the wine coming out of Lodi is really top-notch and the price points are most agreeable, you’d pay a lot more for this quality if it came from a county in wine country starting with an S or an N.
I can’t tell you Lodi is the most lovely place I’ve ever been to and I’ve never seen so many grapes growing on flat ground, but it’s kind of quaint and trying to look sharp and really not a bad place to get stuck in… again. You should find two terrific recipes following this edition of the Whine, a really delicious French Onion soup that takes a bit of cooking but it’s worth it, really, really good and even better the next day. To go with the soup a simple and straight forward meatloaf – both real comfort foods enjoy!